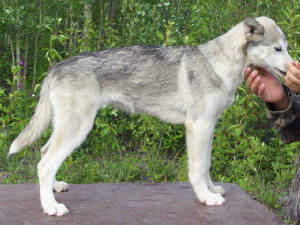 Aurora was run last winter all short distances since running pups and young dogs, we kept all the didstances short. She has a hard worker and always kept her tug tight. We had a litter before from the same mom and dad and had no males from the litter, we have 2 females from the first breeding and hoped to get males out of the repeat breeding. We were blessed with 4 males and Aurora. We kept the entire litter and now are selling Aurora. She is a sweet hard working female and we are selling her because I am happy with my other 2 females from the previouse litter and the males from this litter. She is a great dog, but a little on the small side of what I want. She is up to date on vaccines and has had no health or injurys, never been bred. 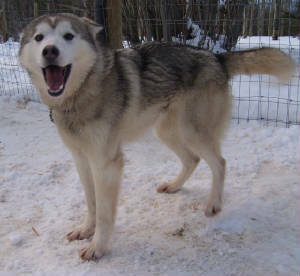 Aurora's mom and dad and siblings can be seen on the main site.